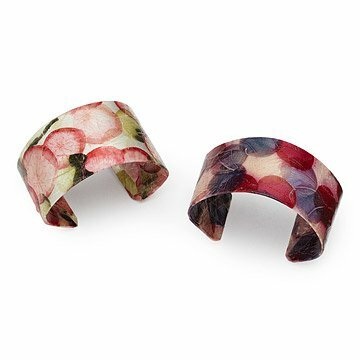 These shimmering metal cuffs are decorated with translucent vegetable parchment. Maggy Ames captures the essence of springtime in these gorgeous, shimmering cuffs. The brilliant circles of color suggest blossoms collecting on the surface of a pond, but Dorfman actually creates them using fresh fruits and vegetables. The most colorful varieties are cured, pressed, aged and dried into a thin sheet. The sheet is then fused to a copper cuff that shines through the parchment, producing a lovely glow. Handmade in California. Choose one of two color combinations: Watermelon Radish/Zucchini/Thai Green Papaya (left) or Beet/Purple Cabbage/Watermelon Radish (right). See how Margaret is striving to be sustainable in the face of drought in California on the blog. Cuffs are delicate; use care when adjusting. Store out of direct sunlight. I gave this to my mother as part of her birthday gift. Thankfully I sent something else as this cheaply constructed bracelet started chipping and fell apart after she wore it once. She is sending it back. My sister-in-law loved it and thought that the materials made the bracelet unique. I bought 2 for my mother and mother-in-law. They are very pretty cuffs and Im hoping they will be easy to put on since they felt a bit stiff. Overall, they are a very nice look. Bought this bracelet for my sister's birthday. Loved the vibrant colors. My sisters saw the bracelet before it was wrapped as a gift and said it was beautiful and exactly Mom's style. Mom loved it, too. This gift was perfect for my sister-in-law who has everything and can buy anything she wants. Beautiful bracelet, well presented. Love the information about the artist.